Now, click below the header's square pin, and enter + in the dialog that pops up. Use the S key a whole bunch of times to make it bigger, then use the selection tool to move it in place. Do the same for the - label. Now that we're done with the labels, set the grid back to 100 mil in case you move any of the traces or parts; once they're off-grid it's hard to get them back on to the grid. We're done editing the board now, so if you haven't already, save your work. But now that the board is done, what do we do with it? Well, that depends on how you're going to make your board. If you want to do it yourself, you probably want to send it to your printer. If you want someone else to make it, they'll probably want gerber files. In your File menu, there are three options we're interested in. The Print Layout... option prints your layout, but note that it will print 11 pages of board layers! This probably isn't what you normally want, but let's do it anyway. There are a lot of options there, but there's only a couple you need to worry about right now. Select fill-page and ps-color and click OK. Fill-page zooms your prints to fill the page. PS-color causes each layer to be printed in the same color as you see on the screen. If you're making boards at home using toner transfer, you want these options off, and you want mirror on. Click on gerber so we can create some Gerber (RS-274X) files, which are industry standard file for describing circuit boards. For a single sided board, most fab houses will need the back, backmask, plated-drill, frontsilk, and fab files. 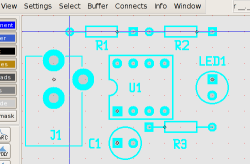 pcb always produces positive gerbers in case the fab asks. For home fabrication, you'll want to print (see above) without the ps-color or fill-page options. 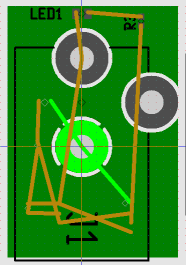 For this simple board, printer calibration is not needed. If you're drilling your own holes, you may want to select the drill helper option, which reduces the diameter of the holes in the copper wherever you're drilling to help you center the drill properly. If you use the ps exporter, selecting the multi-file option puts each layer in a separate file. That way, you can print only the layers you're interested in. That's it! The next step is to actually make board (or have them made), which is beyond the scope of this tutorial. 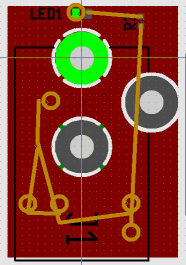 This next board will introduce some additional concepts in pcb that will help you with more complex board. It is assumed that you've gone through the previous board, and those concepts will not be re-explained. 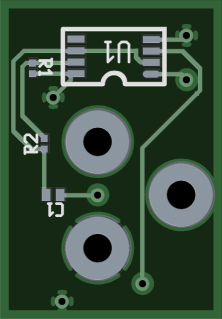 This board will be another single-sided board, but with additional components. 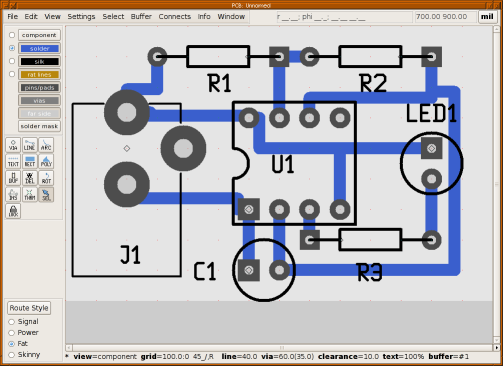 We will use a schematic to describe the circuit, create some custom symbols and footprints, and learn to use the autorouter. This project file tells gsch2pcb where to get element descriptions, which schematics to read (we only have one), and what base name to use for the various output files. We must create two custom symbols for this project. The first is for our power jack, and is a purely custom symbol. 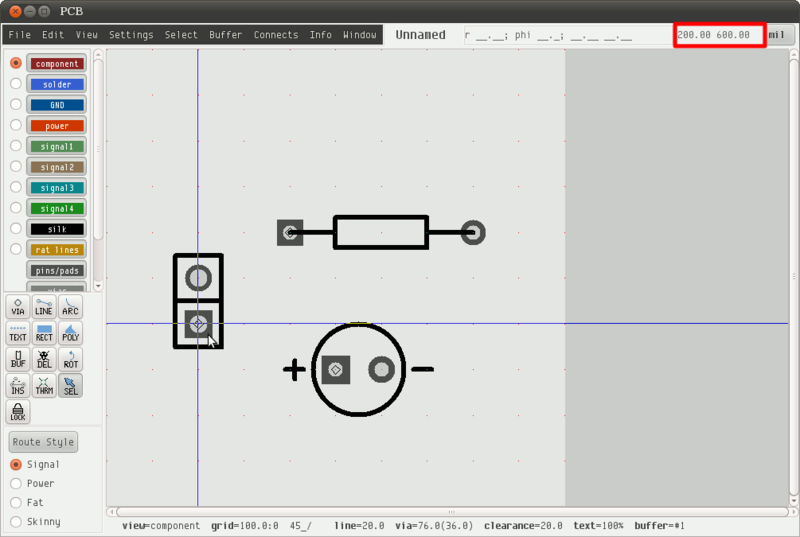 Creating such symbols is beyond the scope of this tutorial. Please refer to the gschem documentation for that. 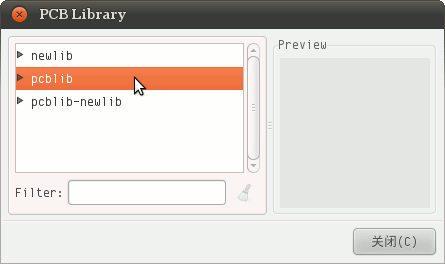 The second symbol uses the djboxsym utility which you can download from the web (see http://www.gedasymbols.org/user/dj_delorie/tools/djboxsym.html). 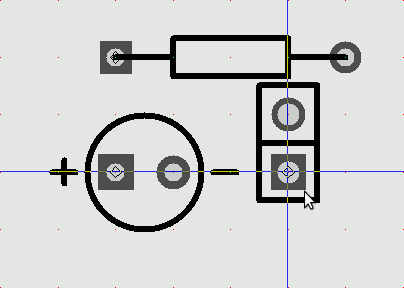 Now we must create the custom footprint for the power jack. 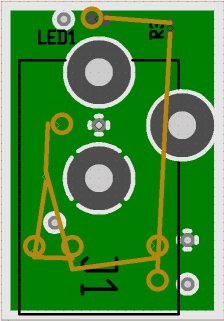 While there are various contributed tools that can be used for large footprints (like BGAs), for small parts like this the easiest way is to create the footprint in pcb itself. 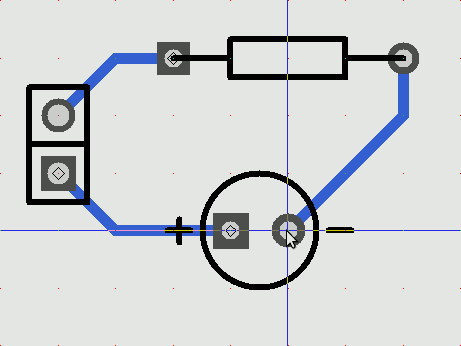 This is done by creating a board with vias and lines, then converting it to an element and saving it. 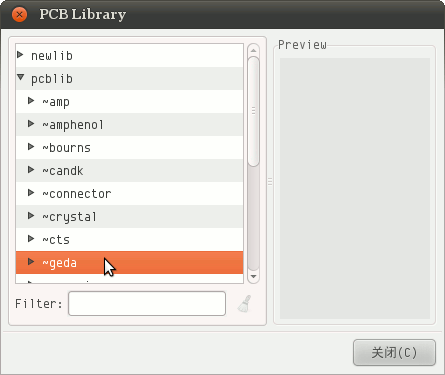 Change to the footprints subdirectory and start pcb. It doesn't matter how big the working area is, or the layer stackup. Looking at the specs for our power jack, we note that measurements are given in tenths of a millimeter, so we'll use a metric grid. To start, set the grid to 1mm, move the crosshairs to the center of the board, and press Ctrl-M to set the mark. This will be the reference point for all our measurements. By doing this with a large grid value, we ensure that it will be easy to click on the same spot later on if needed. 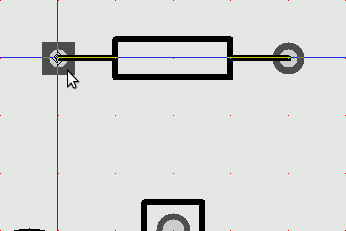 Now set the grid to 0.1mm, which we'll use to place all our vias and lines. We're using vias to create pins, so we need to set the via size and drill diameter. 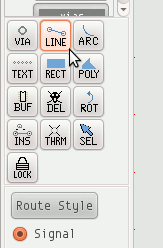 Click on the Route Style button to bring up the route styles dialog, and set Via hole to 1.6mm and Via size to 3.6mm. 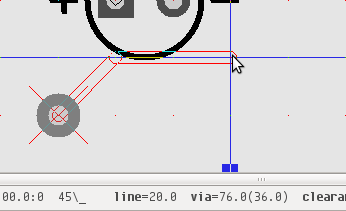 While we're here, set Line width to 0.15mm, we'll need that when we draw the outline later. Now, zoom in enough to see the grid points. Place one via 3mm to the left of the mark, one 3mm to the right, and one 4.7mm above. Sequence is important! The pins will be numbered in the same order as the via creation. To place a via, select the Via tool, position the crosshair, and press the left mouse button. Now, set the grid back to 1mm so we can easily click on the mark. Select everything by using the Select→Select all visible objects menu button. 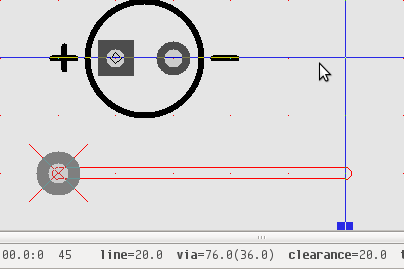 Position the crosshair on the mark and press Ctrl-C to copy all the objects to the buffer. Use the Buffer→Convert buffer to element menu button to convert the buffer to an element. You can now click somewhere else on the board to paste a copy of your new element for inspection. The first thing to do is check the pin numbers. Place the crosshair on the mark and press the D key to turn on the pin numbers. Check to make sure they're correct, then press D to turn them back off again. Now, we're going to set the default position of the label. Place the crosshair on the mark and press the N key. Change the element name to J?. By default it shows up at the element's mark. 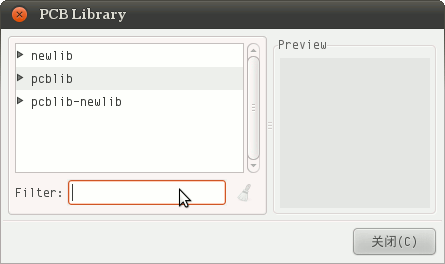 Use the selection tool and S key to position the label as shown below. Using the selection tool, position the crosshair on the element's mark and click on it to select it. Press Ctrl-C to copy it to the buffer, and use Buffer→Save buffer elements to file to save your new footprint to a file. Save it as pj-102.fp in the footprints directory. 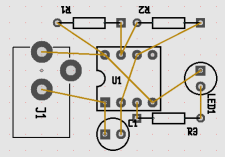 Note that the name of the file must match the footprint attribute you used for the power jack in your schematics. Congratulations! You've created your first custom footprint. Now that we have our schematics and custom footprint, we need to figure out how to start the board layout. 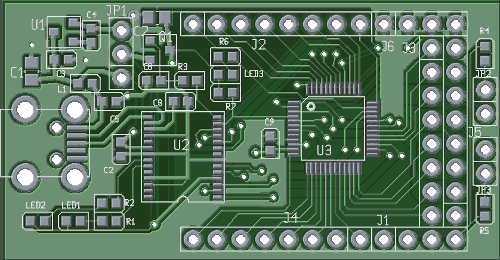 The tool we will use is gsch2pcb, which reads schematics and can create or update a board to match. Since gsch2pcb doesn't use the same defaults as pcb, we will create the board in pcb and only use gsch2pcb in update mode. When creating a non-trivial board, it's a good idea to start with a larger board than your final size. For this project, the final size will be 1.4 inches wide by 0.9 inches high. However, we'll start with 2 by 2 inch board to give us some room to move things around. Run pcb and create your board, setting up the size, layers, and styles just like in the last project. Make sure you set a 100 mil grid, since the parts we're using are all designed with 100 mil spacing in mind. Also, make sure Settings→Crosshair snaps to pins and pads is checked. 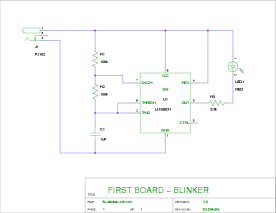 Save this empty board as fb-blinker.pcb and exit. 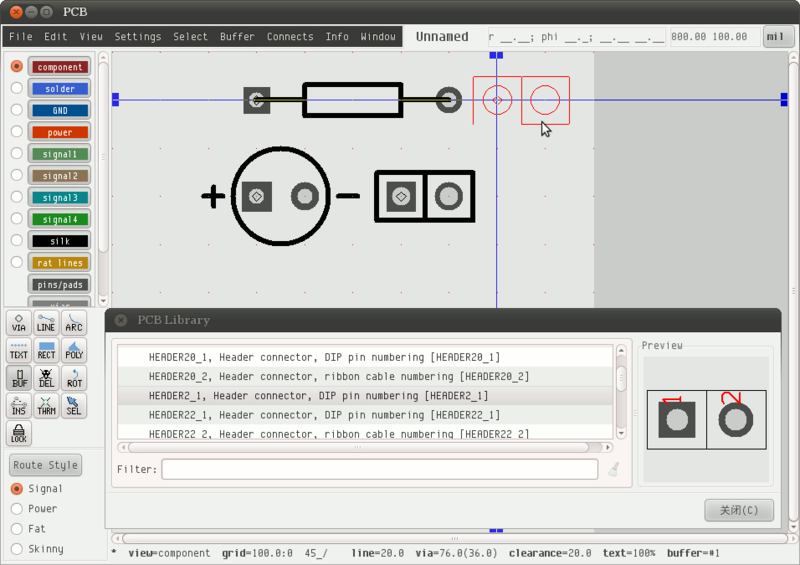 1 file elements and 6 m4 elements added to fb-blinker.new.pcb. 1. 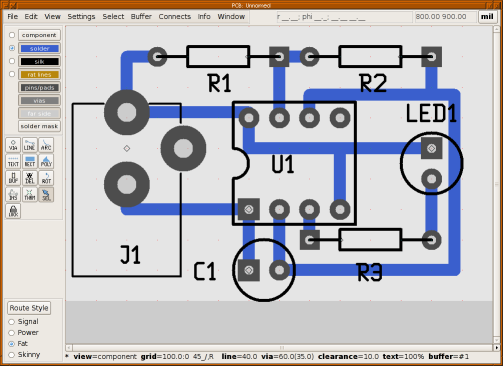 Run pcb on your file fb-blinker.pcb. 2. 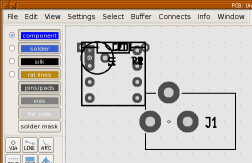 From within PCB, select "File -> Load layout data to paste buffer"
and select fb-blinker.new.pcb to load the new footprints into your existing layout. fb-blinker.net to load the updated netlist. to update the pin names of all footprints. 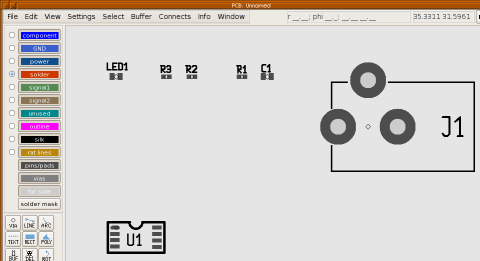 What gsch2pcb does is remove elements from your board that don't exist in the schematic, provide new elements that need to be added, generate an updated netlist, and create a script that renames all the pins. You don't need to use all these - for example, I rarely use the pin renaming script - but we will this time, so you can learn how each file is used. 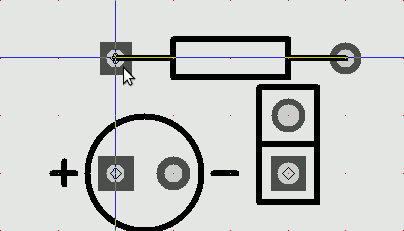 If you position the crosshair over U1 and press the D key, you'll see that the pins are now labelled with the same labels as in the schematic. You can use the View→Enable Pinout shows number menu checkbox to toggle between the symbolic labels and the original pin numbers. Now, as before, we want to rearrange the elements to minimise and simplify the connections. This is where the rats come in handy. As you rearrange the elements, the rats follow, so you can see how rotating and moving elements affect the layout. 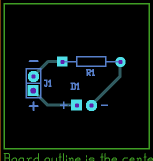 As you move elements around, press the O key to tell pcb to figure out the best way of connecting everything in their new locations. As you move the elements around, remember to pick up the power jack by its mark, as the power jack's pins have metric spacing. The other elements should be picked up by their pins, since they have inch spacing. By picking up elements by their pins, you ensure that their pins end up on the grid points when you put them down. Rearrange your elements so that they look like this, somewhere near the center of your board. Note that the rats nest will tell you when you have the resistors backwards, since they don't have polarity like the LED or IC have. Click to de-select and change the board size to 1400 mils wide by 900 mils high. Don't forget to save often! Again, we're planning on hand-soldering this board, so select everything and make all the pins 10 mils bigger than the default. The autorouter uses the rats nest to determine what connections will be autorouted, so press O now to make sure all the rats are present and reflect the latest position of the elements. 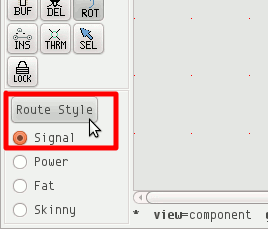 To do the autorouting, simply select the Connects→Autoroute all rats menu option. Your board is done. 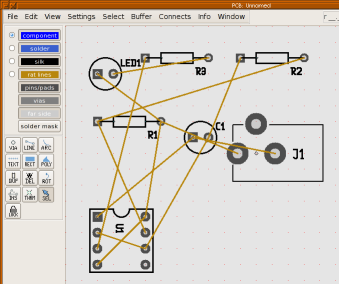 As before, you can print your design or produce Gerber files, according to how you're going to have your board made. The third and final board in the first board series will teach you about multi-layer boards, vias, and SMT components. Again, we assume you've done the other two boards, and will not re-explain concepts taught there. 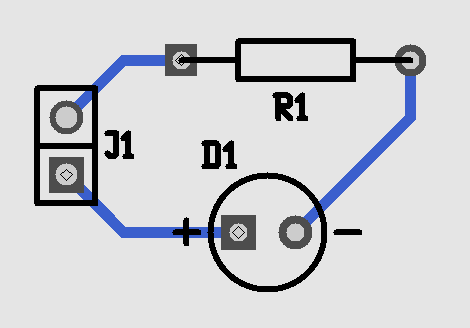 We will be using the same circuit as the last board, but to make things interesting, we will be adding some constraints. The board must be as small as possible, EMI-proof, and able to handle rework. Ok, I'm making this up, but what it means is that we will be using the smallest components a hobbyist can expect to use, a four-layer board, and more vias than would otherwise be needed. We do this to give us the opportunity to learn these techniques, without spending undue time due to an overly large schematic. 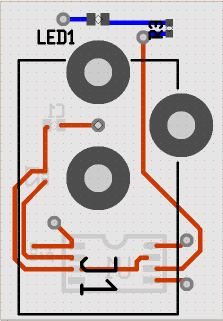 Run pcb and set up your blank board. Put component and component side in group 1. 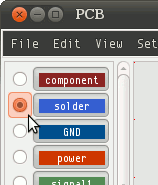 Put GND in group 2, power in group 3, and solder and solder side in group 4. 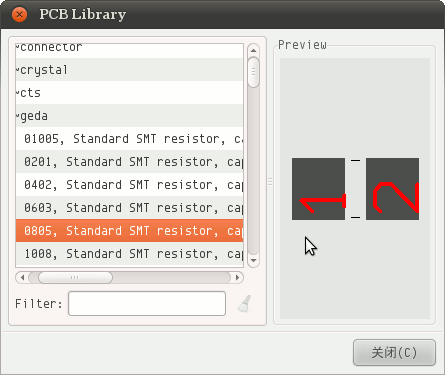 Switch to the Change tab, select the solder layer in the main window, and move the solder layer down under the power layer. Set the board size to 50 mm by 50 mm. 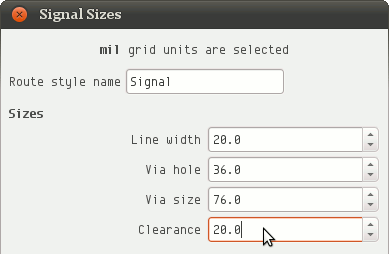 To set a metric size, use the View→Grid units→mm menu option. Then, the Sizes preference will use millimeters. 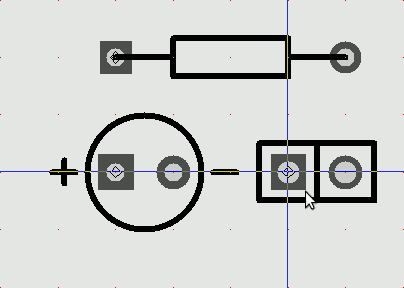 Set the DRC values to 0.35 mm (about 13.5 mil) for drill and 0.15mm (about 6 mil) for everything else. Save your board, exit pcb, and run gsch2pcb fb-smt.prj. 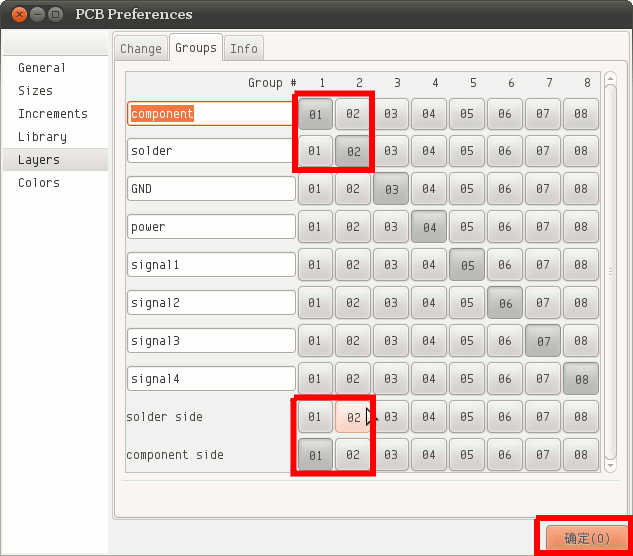 Go back to pcb, import and disperse the new elements, and load the netlist. The element shows as a light gray because it's now on the far side of the board (Note that one of the layer buttons says far side on it). You can flip the board over (making the far side the near side, and visa-versa) by pressing the Tab key. Since the elements we need to place are on the far side, now, flip the board over. 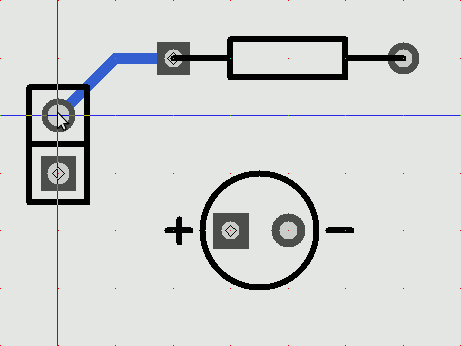 Note that this is an up-down flip, so the power jack now appears in the lower left corner instead of the upper left. There are other types of flips you can do by using Shift-Tab (left-right flip), Ctrl-Tab (180 degree rotation), or Ctrl-Shift-Tab (nothing moves, sort of an X-Ray view). 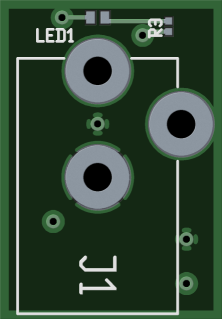 When you run pcb again, the board will have the right size. Set your grid to 0.5 mm and make sure it's visible. There are two ways to create a plane layer, which means a layer that's mostly copper. Such layers are often used for power and ground planes. 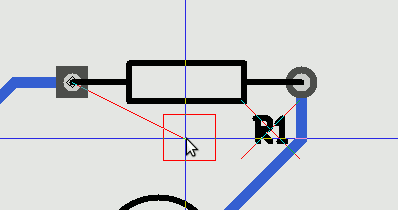 The first way is to use the polygon tool; the second is to use the rectangle tool, which is just a shortcut for the polygon tool. If the color difference is too subtle for you, you can choose other colors through the File→Preferences menu option. We will set the GND layer to green and the power layer to red for the remainder of this tutorial. 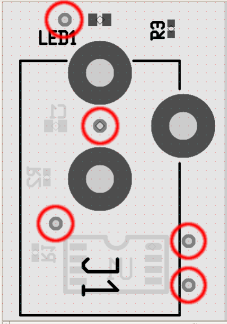 If you optimize the rats nest again, the rats won't connect to that pin any more, and the other pins and pads that need to connect to the ground plane are now marked with circles, meaning these need to be connected to a plane. Anyway, make the power plane the current plane, find the VDD net in the netlist and create its thermal on the found power jack pin. 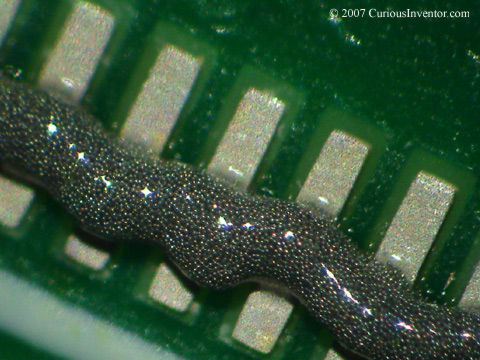 Note that the green GND thermal fingers on the other pin show through the gap in the red power plane - thermals are created on a specific layer, not on all layers. 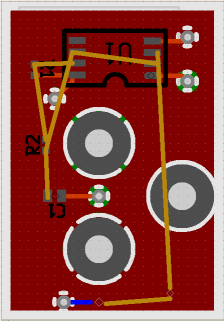 Note that I've shut off the ground and power planes, as well as rat lines, to help you see where the vias should go. 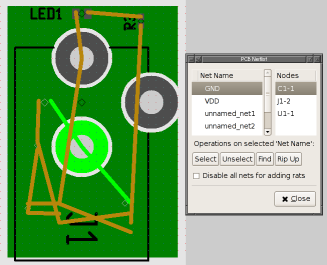 Shut off the GND plane and find the VDD net again, to highlight which rat circles (and thus their vias) need to connect to the power plane. 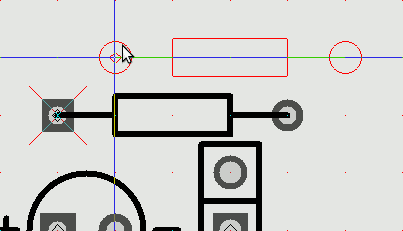 Like you did with the power jack's pins, use the thermal tool to connect the relevent vias to the power plane. Repeat for the GND plane.